My daughter sent a video that she thought I would enjoy on French school lunches. As you know, I love Paris and often appreciate the Parisian/French approach to daily life. 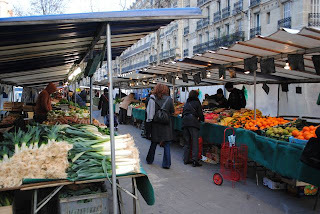 When I think of Paris these days, I think of the winter public markets that take place weekly in all the neighborhoods. 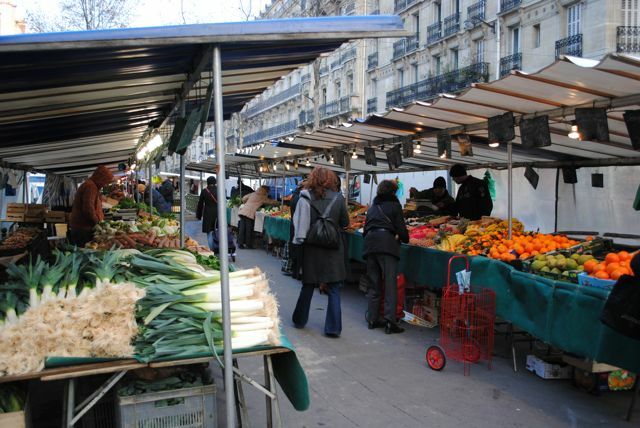 I last visited in January and despite some dreary weather, the markets were filled with Parisians buying fresh vegetables, meats, dairy, and fish for their meals. My Winter Greens quilt reflects these memories. With memories of those markets, I was not at all surprised at this video! Just in case my embeded version does not work, I am including a link to the video also. Wonderful! We weren't big fast food eaters when my kids were growing up, and I had a veggie garden so they learned where at least some of their food comes from...but I know their school lunches were nothing like this, because I made 'em. Sandwiches, sandwiches and more sandwiches. What a wonderful alternative is offered by the French!